This past week was a bit of a rough one. My dear sweet grandfather passed away at the age of 95, and while we all knew it was coming, it’s still hard to imagine life without him. So when I’m feeling a little down I go for a run, go to yoga and bake. 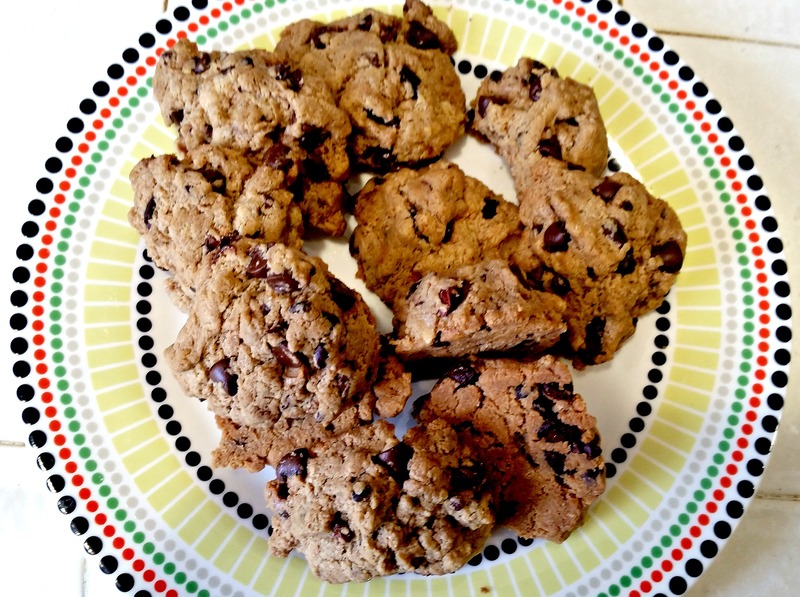 And these tahini chocolate chip cookies from the Meals Made Simple cookbook were just what I needed. I have been on quite the tahini kick lately. I made tahini dressing for my Asian slaw, I used it as a sauce for some zoodles, and now I’m using it in cookies! I’ll admit I was a little skeptical when I first saw the recipe in the cookbook, but Danielle Walker swears that these are the best chocolate chip cookies ever so I was game. Plus, it’s another recipe to check off for the 2015 cookbook challenge! When I first made the cookies I handed one to the Englishman to taste without telling him what was in it. He couldn’t detect the tahini at all! He said they had a slightly nutty flavor (which I agree) but you wouldn’t know it was tahini unless someone told you. If you are looking for a different cookie that’s grain free and doesn’t use the standard almond butter, try this recipe with tahini! I modified a few of the ingredients based on what we had, but for the most part followed the recipe exactly. The original recipe makes 24 cookies, but you can cut it in half if you don’t want that many cookies in the house 😉 I have also found that these cookies freeze really well (and taste good frozen too!). Preheat your oven to 350F. Line a baking sheet with parchment paper or coat well with cooking oil. Mix your egg white and maple syrup until mixture is smooth (use a hand or stand mixer if you have it!). Gently fold in your tahini, tapioca starch, vanilla, salt and baking soda and continue to mix. Add your chocolate chips and cacao nibs. Place spoonfuls of dough onto your baking sheet. For crispier cookies, flatten your dough a bit. Place in the oven and bake for 15 minutes. Cool and enjoy! This was such an easy recipe to make and I love that it’s paleo friendly AND uses tahini. I already can’t wait to whip up my next batch. 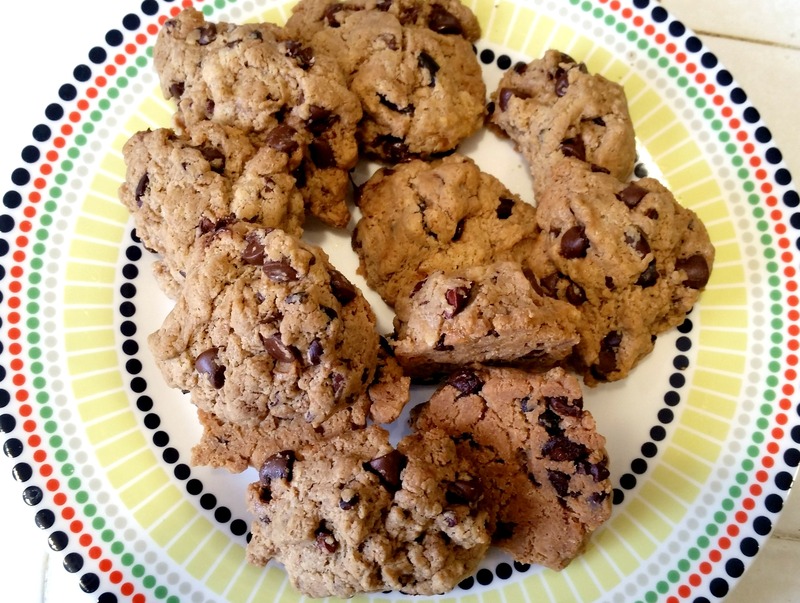 This entry was posted in Baking, Cooking, Dessert, Gluten-Free, Good Eats, Paleo and tagged 2015 cookbook challenge, cookies, tahini on April 24, 2015 by allie@sweetpotatobites. Yummy, these look really good! I’m so sorry about your grandfather! Loss is still hard, even when it’s expected. I’m glad you’ve found some things to brighten up your week a bit! These cookies sound delish!